Denny Jump (Bellevue, WA, United States) on 6 January 2015 in Animal & Insect. "Labrador Air Flight 13,773, this is JFK Tower 3, you are now cleared to land on Runways 4,6,7,8, 9, and 13!" Hopefully, they all have collision-avoidance switched on ! jfk tower 3, this is labrador air flight 13,773! we believe we've got lost in a blizzard or a white-out ... we can't tell the runways from a snowfield ... mayday, mayday !!! so many of them - beautifully captured! 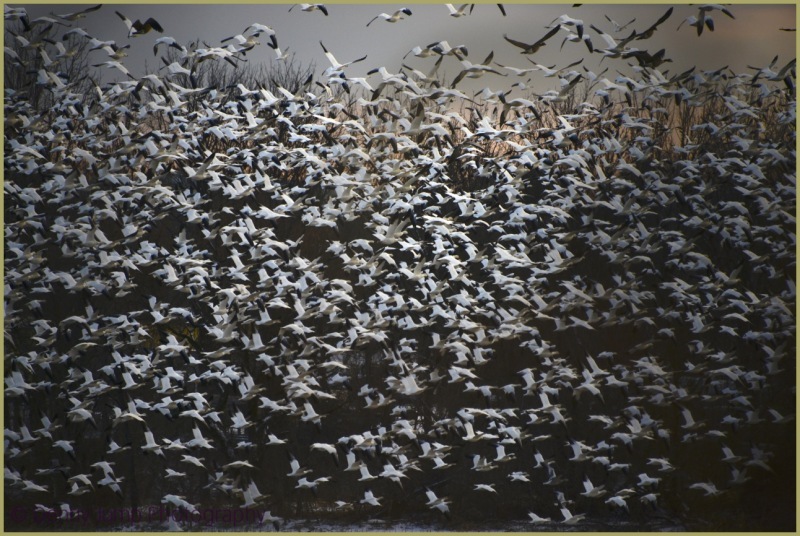 I thought you had blizzards of snow but it's a blizzard of snow geese. Cool shot! THANKS EVERYONE - I AM TRYING TO GET BACK TO THE POINT WHERE I CAN RESPOND AND ALSO COMMENT ON YOUR BLOGS AS WELL. MY LOVE TO YOU ALL. Awesome, Denny! Beautiful photo! All the best for 2015 to you and your family!